The Twisted Tales is an anthology series published by Disney Books that tells “what if” twists on classic Disney stories. The first three, all written by Liz Braswell, focused on some of Disney’s most iconic villains. Elizabeth Lim takes the helm of the first Twisted Tale based on a Disney Princess and asks: What if Mulan had to travel to the Underworld? 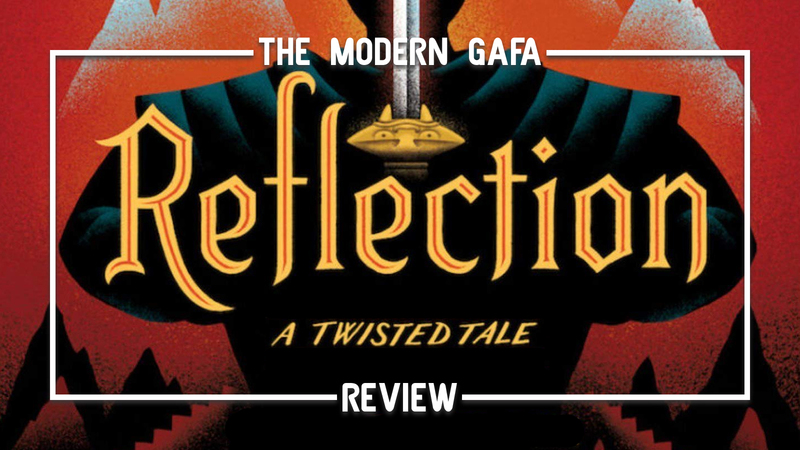 Check out my full review of Reflection: A Twisted Tale after the jump. Disclaimer: I was sent a copy of Reflection: A Twisted Tale courtesy of Disney Books. The premise of this book cracks me up. I’d never heard of these Twisted Tales until this showed up on my doorstep one day. The other ones in the series seem to follow diverging paths along the original movie’s plot, but this one is so random I love it. “What if Mulan had to travel to the Underworld?” That’s it. That’s the book. It starts, she goes to the underworld, she leaves, and the book ends. The fact that the premise of every book’s premise begins with the words “What if” feels very old school comic book to me too. What’s more, the phrase “What if Mulan had to travel to the Underworld?” appears on the dust jacket a total of three times. I find this whole thing hilarious. The book itself? It’s brilliant. The first three Twisted Tales book followed a royal vizier, a mistress of evil, and a monstrous beast. By following a Chinese woman who fled home to take her father’s place in the war, Reflection is the first in the series to be about an actual real, relatable person. This was the right move. Throughout Mulan’s journey through the underworld, we are treated to some real insight into her childhood, her family, and her relationship with Shang. The adventure also has a ticking clock, so Mulan never gives up and never takes a break. The strain she endures is as physical as it is mental and emotional. What makes this story even more gripping is the fact that Mulan descended into the underworld while still disguised as the soldier Ping. She is forced to keep this charade going in the presence of her guide to the underworld, the ghosts of her ancestors, and even King Yama himself. Mulan wants nothing more than to tell Shang the truth, but she knows doing so would greatly jeopardize… everything. Mulan’s journey through the underworld is very reminiscent of stories like Alice in Wonderland, The Wizard of Oz, and Labyrinth. Each level of Diyu offers a new obstacle for her to triumph in a new, vividly described location. If you’re a fan of East Asian mythology, history, and culture - oh boy are you going to love this. Mulan travels through dozens of the twisting levels of Diyu, the Chinese realm of the dead, visits the city of Youdu, crosses the Bridge of Helplessness, makes a deal with King Yama, outwits ghosts, and battles demons. One thing I feel obliged to point out: there is no Mushu! He is in the opening chapters, but Mulan decides not to wake him be descending into Diyu. Honestly, though it’s for the better. There was something about those few scenes he does appear in that felt off. I just couldn’t hear Eddie Murphy’s voice in Lim’s text. Instead, Mulan is joined in the Underworld by Shishi, a stone lion and the guardian of the Li family - Shang’s family. I feel like Lim was more comfortable with a character of her own than trying to emulate one that most readers will associate with a specific actor. Reflection is a non-stop adventure into the darkest depths of Mulan’s despair. It’s an amazing “what if” storyline that takes readers on a journey through the Chinese underworld all while exploring the character of Mulan, a Disney Princess who is deep down neither a bride to be nor a soldier at war. She is also not a princess, but that is beside the point. I highly recommend checking out Reflection: A Twisted tale to any fans of Disney, mythology, and spooky underworld adventures. Click here to get your copy of Reflection: A Twisted Tale today!